Extremely economical, easy to operate. Dust-free sweeping up to 3400m²/hour. Battery driven or petrol engine for industrial applications. 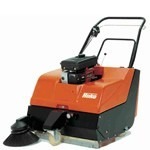 Hako Hamster 600/700/780: Compact vacuum sweepers for quick, dust-free floor cleaning. Excellent sweeping performance on all types of floors; even carpet floors. Very large dirt collection capacity as a result of the overhead throwing principle. 100% of the hopper volumecan be utilized. Can pick-up coarse debriswithout problem. Easily negotiates door sills and other obstacles. Thanks to the large floor clearance. 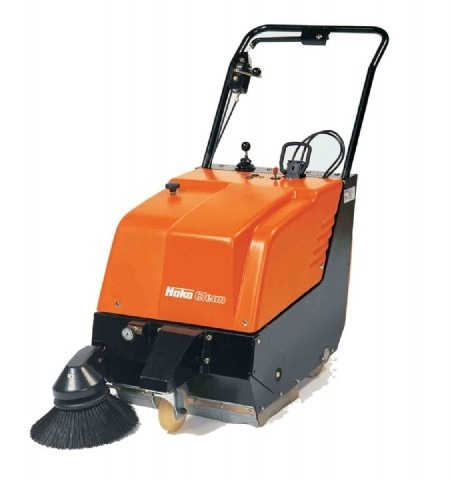 Highly manoeuvrable and large area performance up to 3,400 m² cleanliness/hour. Extremely smooth steering and easy handling. Ergonomically shaped handle bar for fatigue-free operation. Simple, clearly laid out operating elements. Quiet, industrial petrol engine or battery electric drive. Optimum disposal system (`drawer` hopper). The hopper of the Hamster 780 is also available with rollers and seperate hopper inserts for quick & easy emptying – even suitable for heavy debris. An extremely competetive price/performance ratio in their corresponding classes. Optional environmentally-friendly battery drive for indoor use, or a powerful petrol engine for outdoor applications. Particularly inexpensive lifetime costs e.g. robust construction with non-rotting coated steel framework and synthetic material cover which is resistant to damage and shock-proof.